Hey Whipple, Squeeze This has helped generations of young creatives make their mark in the field. From starting out and getting work, to building successful campaigns, you gain a real-world perspective on what it means to be great in a fast-moving, sometimes harsh industry. You'll learn how to tell brand stories and create brand experiences online and in traditional media outlets, and you'll learn more about the value of authenticity, simplicity, storytelling, and conflict. Advertising is in the midst of a massive upheaval, and while creativity is still king, it's not nearly enough. This book is an essential resource for advertising professionals who need up-to-date digital skills to reach the modern consumer. Today's consumer has seen it all, and they're less likely than ever to even notice your masterpiece of art and copy, let alone internalize it. Your job is to craft a piece that rises out of the noise to make an impact. 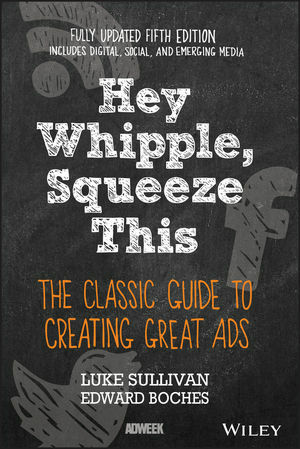 Hey Whipple, Squeeze This provides the knowledge to create impressive, compelling work. CHAPTER 8 Why Is the Bad Guy Always More Interesting? CHAPTER 12 Why Pay for Attention When You Can Earn It?